Here we are in another week of the yarn along though. And, like last week, I have created a video for you – you can find it below. I don’t have much to show you in the way of knitting. I am knitting for my mom, and since she reads my blog, it makes it a little hard to write about Christmas presents! But, this is the most knitting I have done in quite a while, at one sitting I mean. The kids have been cooperative about bedtimes lately, and that has allowed me a bit of down time to knit. And as far as my reading goes, I’m not actually reading anything new this week. Instead, I am talking a little bit about my 2015 reading goal of 100 books, and how I failed miserably at that. I wrote about it yesterday as well. Instead, I am putting out a call to all of you wonderful knitter/reader types to help me make my 2016 book list! My idea is that if I actually write a list of 100 books to read, perhaps then I would be able to read all of those books. I tend to get stuck when thinking about the next book. How is your Christmas knitting going? What is one book you hope to read next year? This is a good reminder that I need to get back into crocheting. I was making tons of things for a while and I think I burned myself out. I don't think I can even come up with 100 books to put on the list. I would like to get through my Writer's Market book…that seems like an easy enough goal to accomplish. I wish I could knit. I failed at my reading goals this year too, but I have read some really interesting things along the way! I enjoy alternating fiction and non-fiction, I find I need the balance. I'm always so envious of those who know how to knit, but I've never had the patience for it. And I'm on book five of the "Outlander" series by Diana Gabladon. Book 1 is my favorite book of all time. But now I have kids, so reading is a luxury I can seldom afford! I love the colors of your yarn. A Million Little Ways by Emily P. Freeman is in my stack of waiting-to-be-read books. I would never have time to read 100 books! But I certainly would love to be able too! But I do read tons of school books to my kids, does that count? I think I may have tried to knit once. Not something I am very good at at all. I wish I knew how to knit. I do a lot of needlework, but I think knitting is fun. I wish I knew how to knit. My mother is learning so I think I should join up with her. I used to be able to knit as a kid, I can't do it anymore and it makes me just so sad! 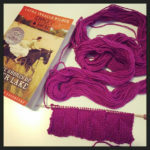 Knitting is a gift I don't have but a reader I am! I just read The Hurricane Sisters and it was a good, beach type read if you need a quick, not too deep story! 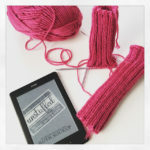 I am not a knitter – but I love that my daughter has taught herself. I will be reading Fate and Fury next. Suppose to be a great book. I've only managed one knitting project and that was my daughter's baby blanket. I would like to get back to doing it again though. I have never tried to knit anything before but it looks like a soothing and therapeutic activity. What has been your favourite project so far? 100 books! 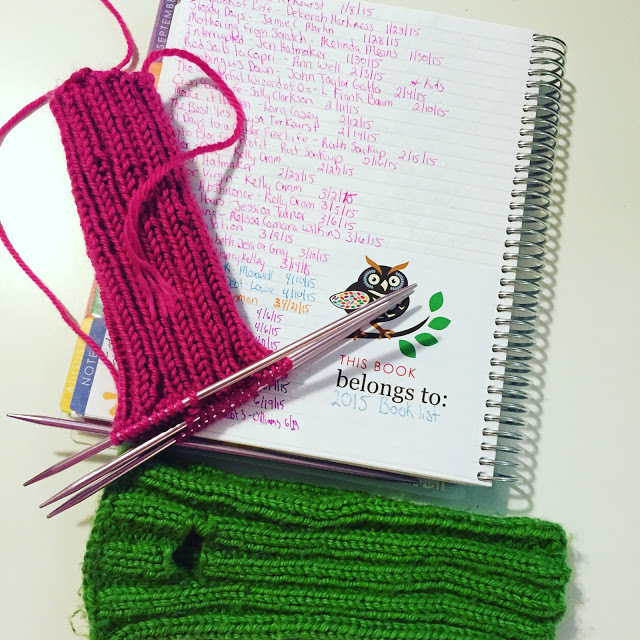 I have been thinking of making a specific "to-read" lost and "to-knit" lost for the coming year to help me keep lining up the books and yarn I'd need for that! I'd never stick perfectly to it but like you, it would help me feel a bit more intentional and I might accomplish more specific goals! Good morning Heather! I have one more socks to cast on. It will be down to the wire…might not finish! Gulp. Great video! I love that people are doing that lately. It's a great way to really get to know you. Books – hmmmm…… I have Eleanor & Park on my Goodreads. I have heard good things about it. Seems like a lighthearted book. I have wanted to learn to knit for a long time. My nana keeps telling me she'll teach me, so I really need to make that happen. You really should! It is such a satisfying craft! Probably because I live in Maine, and warm things seem to be needed, being in Mass I'm assuming you feel the same! I mean, usually, I don't understand this weather right now, but I'm not complaining!